If you are looking for a projector for business or school presentations, you should probably get a more expensive one. However, if you want to get a home media projector that is simple and easy to use, you should definitely consider this model. 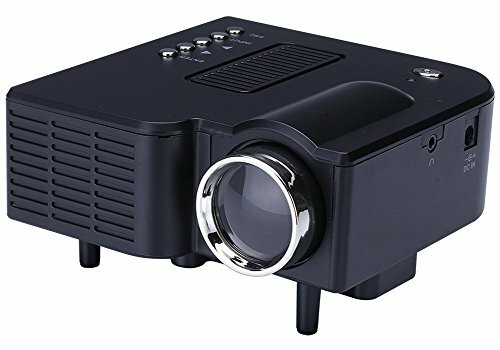 This extremely affordable, but great mini projector is perfect for kids to watch movies, or for date nights, and you can also play Xbox if you’re too picky and after perfect picture quality. Considering it’s a low-end projector, its quality is pretty great actually. It is really easy to focus, and the speakers work pretty well for such a small projector. You can stream content from different devices thru the HDMI port on this projector, and although you won’t get clear HD quality, the picture quality for your movies will actually be pretty good. The 60 Portable Mini HD LED projector is extremely easy to use, you’ll need two AAA batteries for the remote, as well as a stable, good place to put the projector and you’re good to go. A great projector for emergencies, but if you are looking for a device that will provide you with the quality experience, stop right here as this projector is not designed for that purpose. For those that are constantly on the go and are looking for a device they can easily fit in their backpack or a briefcase (only weights 0.4 kg), this is a convenient projector designed for that exact purpose. The LED lamp life span of 20000 hours ensures extreme longevity. Brightness output of 40 lumens doesn’t really do much, but for a purpose of a quick presentation in a smaller room it does its job pretty well. VGA, AV, USB and SD card ports make it convenient to connect the projector to the majority of devices and transfer files with ease. The resolution is something in what this projector does not excel at, but again, providing high quality viewing experience was never its purpose. The 320×240 resolution will make the content viewable (great for smaller projections for a non-demanding audience), but do not expect a mind-blowing experience. The colors on the other hand are surprisingly good. The device can boast with its versatility, as nearly every popular video, audio and image format is supported. And it ships with a remote control for additional convenience. It’s important to say that the image size can be anywhere between 20 and 60 inches projected between 1.25 and 4 meters distance. It may not sound like a device that will blow your mind, but for a price that this projector goes for, it certainly does its job and you honestly can’t expect it to do wonders. On the other hand, if you are looking for an A class projector, you need to be prepared to spend much more cash in order to get the premium viewing experience.